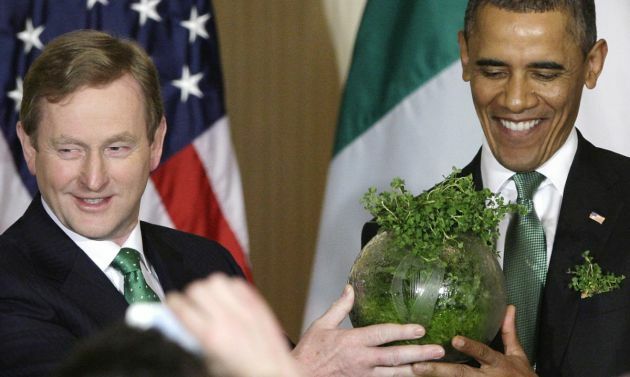 (Photo: Reuters / Jonathan Ernst)Irish Prime Minister Enda Kenny gives a gift of an etched bowl filled with traditional shamrocks to U.S. President Barack Obama during a St. Patrick's Day reception at the White House in Washington, March 19, 2013. Ireland's Roman Catholic leader has urged Irish people and those of Irish descent celebrating St. Patrick's Day wherever they may be to remember the plight of migrants, while U.S. President Donald Trump has been reminded of Patrick's origins. Archbishop Eamon Martin - St. Patrick's modern-day successor as archbishop of Armagh - used his message for the March 17 feast to recall that St. Patrick was first brought to Ireland as a slave by traffickers, Catholic News Service reports. "This is so shockingly exemplified by the refugee crisis here in Europe," he said, Catholic News Service reported. "Prompted by the situation of thousands of displaced people around the world, let us think about Patrick the 'unlearned refugee' (as he once described himself), the slave in exile, Patrick the undocumented migrant," Archbishop Martin said. In Washington DC on March 16, U.S. President Donald Trump faced deep embarrassment at his own reception to mark St Patrick's Day, as the Irish leader with whom he shared a stage strongly defended immigrants in a passionate speech. Trump had to watch on as Ireland's Taoiseach (Prime Minister) Enda Kenny delivered an address that asserted immigrants "lived the words of John F Kennedy long before he uttered them," Huffington Post reported. But Trump's expression became sullen as Kenny delivered his heartfelt speech on showing compassion towards migrants, given the US President's long-standing opposition to immigration. Kenny said: "It's fitting that we gather here each year to celebrate St Patrick and his legacy. He too was an immigrant. "And though of course he is the patron saint of Ireland, around the globe he is also a symbol of, indeed the patron of, immigrants. "Here in America, in your great country, 35 million people claim Irish heritage. "And the Irish have contributed to the economic, social, political and cultural life of this great country over the last 200 years. "We believed in the shelter of America, in the compassion of America, in the opportunity of America. "We came and we became Americans. We lived the words of John F Kennedy long before he uttered them. "We asked not what America could do for us, but what we could do for America - and we still do." St. Patrick is considered to be the patron saint of Ireland, but he was not born there, but probably in neighboring Britain as the son of a Roman-British soldier. He landed in Ireland after he had been captured by pirates and sold into slavery. Archbishop Martin said that "as Irish people, we cannot think of Patrick without acknowledging the enormous humanitarian and pastoral challenges facing growing numbers of people who find themselves displaced and without status in our world." He referred to, among others, an estimated 50,000 Irish people living illegally in the United States. The first documented St. Patrick's Day Celebration in Philadelphia was held in 1771. Philadelphia's Friendly Sons of St. Patrick was found to honor St. Patrick and to provide relief to Irish immigrants in the city. Irish Americans have celebrated St. Patrick's Day in Philadelphia since their arrival in America. Archbishop Martin - who is also president of the Irish bishops' conference - pointed out that "many of our compatriots remain undocumented in various countries around the world and, in some cases, feel vulnerable and treated with suspicion." The archbishop pointed out that, "St. Patrick's experience of isolation and captivity as a teenager transformed and shaped his whole life and his relationship with God. His lonely time as a slave on the hills of Ireland became a transforming experience, where he felt embraced by the fatherly love of God. "I invite you to pray for refugees and for all displaced families at this time and, wherever you are, to encourage the hospitality and welcome for which we, Irish, are famous the world over," the archbishop said.